Children love video games, iPads, smart phones, and so on, but what’s awesome about laser tag guns for kids is that it allows them to be active, either indoors, or outside in the park. Kids have lots of energy, and an intense game of laser tag is the perfect way for our children to be active with their friends and to be able to release that energy. In addition to that, laser tag is also a very social game. Kids get to play together in teams and come up with strategies. Kids can learn to work together, and bond with eachother at the same time. Video games, on the other hand, are often very solitary toys. Laser tag for kids is also very safe. The laser tag toys themselves are very robust and the laser beams are completely harmless. What’s great about laser tag is that the focus is not on “shooting” one another. The purpose is to aim your laser beam at a target to score points, not to “eliminate” someone. In short, laser tag is fun, intense, healthy, social and completely safe. Are you yet to try laser tag? Are you looking for new ways to entertain your children? Try laser tag toys, you and your kids will love it. Here is a list of some of the best kids laser tag guns and sets currently available. The 2 guns look like spaceships which will appeal even more to small children. Without any unnecessary features, the guns are very straight forward and easy to use. The grips of the spaceships are such that they fit small and big hands so that parents can use them too to play with their kids. During play, the laser guns produce intergalactic sounds and vibrations which will make the game even more exciting. It must be said though that the sound effects can get a bit annoying after a while as they are always there. Another bonus is that you can buy more than one set and all guns will work together. This is great if you have a whole army of kids ready to play laser tag. At a very affordable price, this kids laser tag set is perfect for kids to get familiar with the exciting world of laser tag. Turn the lights off and let the laser tag fun begin! This kids laser tag set of (one in bright orange and the other one in green) is the perfect entry level laser tag set for children aged . Not only are these laser toys very to wear and , they are also very robust. >> Check out our in-depth review of the Discovery Kids Spaceship Laser Tag Set. 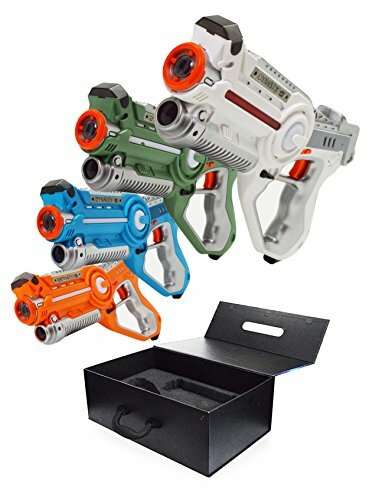 The Call of Life kids laser tag set by Simply Addictive Games, with 4 very sophisticated laser guns in 4 different colors (red, green, blue and white), is a great step up from the spaceship laser tag set above. Each individual blaster gun is loaded with great features that make the laser tag battle so much more exciting. With 4 different blaster settings, you can decide yourself how you want to approach your opponents, with each setting giving you different reload times, stoppage power and range requirements. Each gun will also inform you about your life status and which team you’re in during play. And there is no need to wear vests because the laser tag guns themselves have infrared targets. This set also gives you 4 different team settings. You can decide to play one-vs-one or in different teams. The team and blast settings on the guns are interchangeable so you can play with as many guns as you like. If that’s not enough, the blasters also produce awesome sound effects and have a very impressive range, up to 120 feet! The guns are very intuitive and easy to use. With so many features, this 4-pack kids laser tag set is a great deal. Suitable for children 10 years and over. >> Check out our in-depth review of the Call Of Life laser tag set. This 2-pack kids laser tag set is the same as the 4-pack above but with 2 blasters instead of 4, in white and blue. It’s important to point out that all these guns can be set to work together, whether you buy a 2 or a 4 pack. So if you’re happy with these laser blasters, you could purchase another set and all guns can be combined in one epic laser tag battle. If you or your kids are star wars fans, you could also buy this 2 pack laser tag set with an extra star wars backpack. Both guns fit in the backpack making it easier to carry them around, in style! This laser tag set for kids is for the true spies among us! This set includes two guns and two seperate sensors that you can place on your arms. Firing invisible infrared beams, you can play one-vs-one or you can quietly practice your laser tag skills by playing the solo mode. Suitable for children ages 8 and up. Laser tag is a fun, exciting and very affordable game for children to be active with friends, at home or in the park. Try it out for yourself and see what the rage all about.